Myanmar Foreign Minister Aung San Suu Kyi, center, walks past a Thai honor guard as she arrives at the Suvarnabhumi Airport, Thursday, June 23, 2016. Thousands of Myanmar migrants, eager to get a glimpse of Aung San Suu Kyi, overwhelmed police in a Thai coastal fishing center Thursday afternoon. The Myanmar state counselor and foreign minister, on her first official visit to Thailand since her government was inaugurated, went to Mahachai in Samut Sakhon province to address 500 Myanmar nationals working there. But the overflow crowd of thousands more, barred from entering the venue, lost patience. 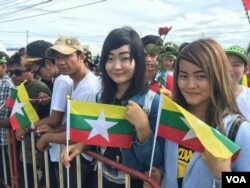 “Long live mother,” they chanted and waved Myanmar flags as security forces tried to regroup and ponder how to get the crowd under control. A downpour thwarted Aung San Suu Kyi's last-minute plan to also address the thousands of supporters who could not get inside. Hundreds of thousands of migrants work in Thailand’s fishery-related industries, about half estimated to be illegally employed.The exploitation of some of them has been well-documented. Overall, there are as many as three million Myanmar nationals working legally in Thailand and perhaps as many as two million more are undocumented. Myanmar and Thailand, during Aung San Suu Kyi’s three-day visit, are expected to announce a new cross-border employment agreement. The mandatory work-break period would be cut from three years to 30 days. “That’s a concession to reality,” said Phil Robertson, the Asia deputy director of Human Rights Watch, noting that many from Myanmar prefer to stay in Thailand illegally after their maximum four-year work period than return home for the extended timeout. “The record for migrant workers is to wait around long enough and the policy will change,” Robertson told VOA. FILE - A boy searches for useful items among the ashes of burnt down dwellings after a fire destroyed shelters at a camp for internally displaced Rohingya Muslims in Myanmar's western Rakhine State near Sittwe, May 3, 2016. Win Win Zaw, who has worked for four years legally at the Bangkok Seafood Factory in Mahachai and was employed illegally four years prior to that, is among those who would benefit from the expected agreement. “It will be much more convenient because most of us don’t want to overstay,” he said. Those who remain illegally face exploitation in Thailand, explained Robertson as the “military and police see the workers as hordes that are a security threat,” and are not sympathetic to their critical role in the kingdom’s economy. Another major bilateral issue for Myanmar and Thailand is the fate of more than 100,000 refugees from Myanmar languishing in nine border camps. Many of them have been there for decades during an era when their country was under military rule. Aung San Suu Kyi, on Friday, is to discuss their future return with the Thai prime minister, who as army chief two years ago seized control of the government in a bloodless coup. Some of the areas to which the refugees might be sent to inside Myanmar remain unstable or littered with land mines, according to human rights agencies. News coverage of Aung San Suu Kyi is being restricted by Thai authorities to an unusual degree. A joint news conference with Thai prime minister Prayuth Chan-ocha is scheduled for Friday during a signing ceremony, but journalists have been told that no questions will be taken. The Myanmar leader is also to give an address earlier in the day at the Ministry of Foreign Affairs in Bangkok but media agencies have been told they will be allowed only to photograph or videotape her opening remarks and a ministry spokesperson will “summarize” her speech for reporters after it concludes. The sensitive issue of the treatment of Rohingya refugees in Thailand overshadowed the start of the visit of Myanmar’s de facto leader. As her jet was en route to Suvarnabhumi Airport activists in Bangkok were quickly muzzled by Thailand’s military government. A small group of police and soldiers, out of uniform, prevented a group from holding a full news conference at a space it had rented in the Foreign Correspondents’ Club of Thailand. Non-government organizations have called for Thailand to end what they regard as the arbitrary and indefinite detention of the Muslim Rohingya and others who have come ashore in Thailand. Aung San Suu Kyi on Thursday was focusing instead on the millions of migrants from her country who are laborers in Thailand. On her first official visit to Thailand since her government was inaugurated Aung San Suu Kyi is to address several thousand of the Myanmar nationals working in the Thai coastal fishery center of Mahachai (from 09:30 UTC). Two activists advocating better treatment of the minority Rohingya in Myanmar read a brief open letter to Aung San Suu Kyi and explained they were prohibited by the junta from answering reporters’ questions. The president of the Burmese Rohingya Association in Thailand, Maung Kyaw Nu, who said he was a former political prisoner in Myanmar, briefly taped a napkin over his mouth as he waded through a crowd of Thai and international journalists. He paused for a few minutes to speak to VOA and expressed little hope the plight of the Rohingya would be addressed by Aung San Suu Kyi during her visit. “We cannot get anything from her because she is also violating the human rights [of the Rohingya],” he said. Prayuth, who leads the junta governing Thailand, told reporters Tuesday he had agreed not to discuss any aspect of the Rohingya with Aung San Suu Kyi during her visit. “It’s a sad day when it’s easier to have a discussion about the Rohingya in Yangon than in Bangkok,” Sam Zarifi, the regional director of the International Commission of Jurists, told VOA. Non-government organizations have called for the kingdom to end what they regard as the arbitrary and indefinite detention of the Muslim Rohingya and others who have come ashore in Thailand. Zinlat Aung in Mahachai contributed reporting.